While driving to his studio in New York&apos;s Rockaway Beach neighborhood, artist Christopher Saucedo looks out across Jamaica Bay. He sees a glittering Manhattan and the spire of the new World Trade Center gleaming in a cloudless sky. "Obviously, where it stands there were once two other very tall towers," the art professor says dryly. Saucedo grew up playing stickball on the streets in Brooklyn and watching the original World Trade Center rise over New York City. His father took him and his brothers to the construction site to watch it being built. The youngest, Gregory, died in the line of duty in the north tower on Sept. 11. "He loved being a fireman," Saucedo says, his voice catching. 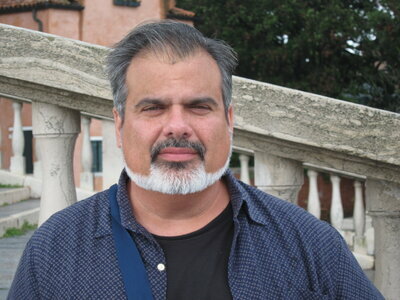 A few days after the attack, Saucedo drove frantically to New York from New Orleans, where he then lived. "I&apos;m a sculptor, so I packed my boots, my gloves, my respirator and some crowbars because I imagined I would be at the pit helping to find my brother," he says. No trace of Gregory was ever recovered and Saucedo went home to New Orleans in grief. Four years later, when Hurricane Katrina hit and the levees broke, his house was flooded to the rafters. "In Katrina, we lost everything except for our Christmas decorations and our Easter baskets, which were in the attic," he says. "Things you don&apos;t want are in the attic." Saucedo&apos;s family evacuated to Houston. Returning to a ruined house was anathema to his wife, who wanted to move back to New York, so they bought a house in Queens just steps from the beach and 7 feet above sea level. Unfortunately, during Superstorm Sandy, a 12-foot tidal surge deluged the house with 5 feet of water. "If you were writing a story, the editor might say, &apos;Drop the second hurricane. It doesn&apos;t read well. It doesn&apos;t make any sense,&apos; " Saucedo observes wryly. "After Hurricane Sandy, I really started to wonder if I was going to be forever put upon by forces beyond my control. It was really like, &apos;Come on!&apos; "
Art helped Saucedo make sense of his experience living through three of the worst events on U.S. soil in the past 15 years. Still, it took a long time for him to address his brother&apos;s death in the fall of the twin towers. "I&apos;m a sculptor who primarily works with steel and wood and cast metals and big physical materials," he says. But after being at ground zero, he didn&apos;t want to memorialize the catastrophe with exactly the same material that comprised the World Trade Center&apos;s remains. Instead, he hand-pressed layers of linen, making 10 blue papier-mâché rectangles. It&apos;s recognizably a Sept. 11 blue — the blue of that day&apos;s sky. There appear to be clouds floating on the surface, but a closer look reveals that they&apos;re wispy renditions of the World Trade Center — two towers seemingly made of vapor, floating up and away. Lord says imagining the World Trade Center as clouds makes something weighty feel weightless and ethereal. "And, of course, the blue paper is incredibly evocative," he says, "because we all remember the blue of the sky that day — that incredibly beautiful day against which all of these unbelievable things unfolded." 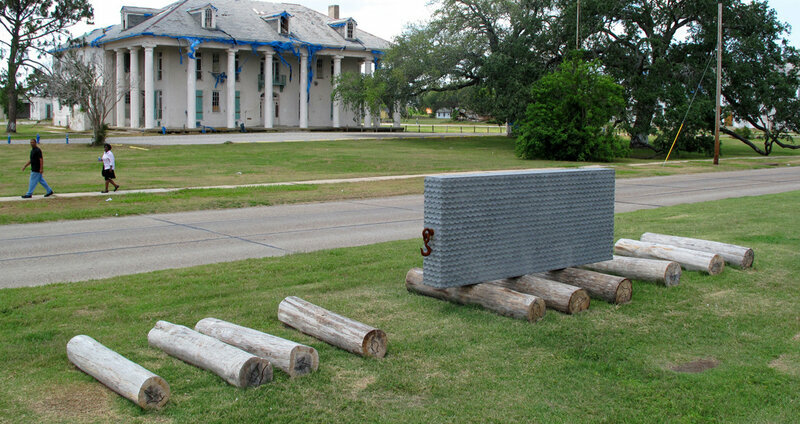 Last month, Saucedo installed another memorial in New Orleans commemorating the victims of Katrina. He says this time every year there&apos;s a flurry of interest in his art. "I hope it&apos;s testament to the quality of my work, but I know it&apos;s testament to my involvement in these tragedies," he says. "And I&apos;m wondering: So now am I the artist who has, you know, misfortune? Is that my new label? I don&apos;t want to be that, but I guess I don&apos;t want to not be that. I just want to be an artist who makes work that&apos;s relevant in his time." After Sandy, the Red Cross went through Saucedo&apos;s neighborhood and gave everyone bleach, a bucket, gloves and blankets. Saucedo decided to use the blankets as the backdrop for new works of art: He&apos;s using them to embroider tapestries. "If you have lemons, make lemonade," he says. 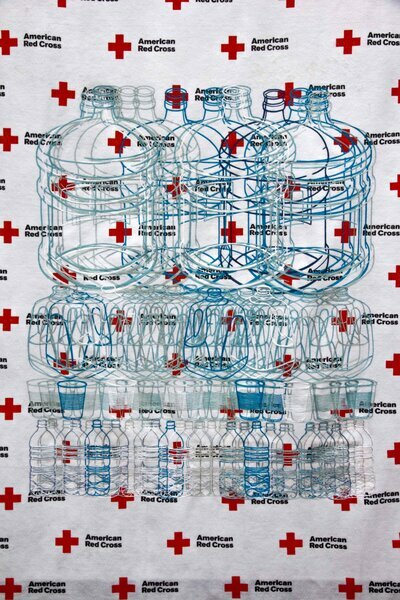 "I had Red Cross blankets; I made some tapestries." The artist is used to awkward jokes about where he and his family plan to move next — so the rest of us will know where to avoid. "We have survived a couple of hurricanes," he says, "so you might want to move with us because we never succumb to the elements." Indeed, Christopher Saucedo endures. He hopes his art helps people relate to his own experience and, more generally, what it means to lose and how we manage to survive.